Notes on the origins of the names are listed below the map. Map based on data from GEOProjects UK Ltd. (with a little work from me too…) Please note: This map is for illustrative purposes only. The representation of any road, path, right of way or boundary is no evidence of actual existence, and should not be taken or used as such. Asplands Close A modern cul-de-sac east off Wood Street, the home for the local Medical Centre and some housing. This replaced a surgery at Aspley Guise, and the name was chosen so as to be familiar for local residents. Asp also fits in with the snake used in some medical symbols. It is said that the original field name was ‘Boggy Willows’. Aspley Hill The main road eastwards up from The Square into Aspley Guise, then onwards towards Bedford. 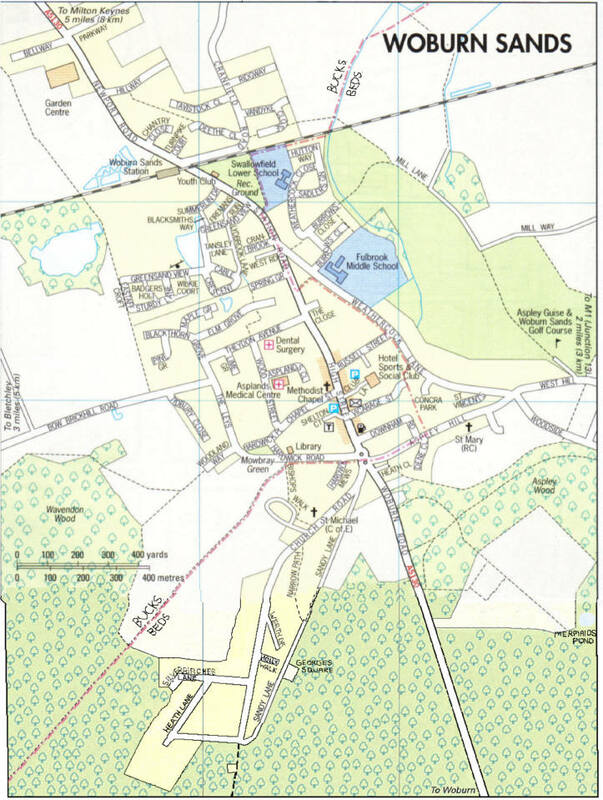 At the bottom of Aspley Hill was an area known as ‘Cheapside’, the first commercial centre of Woburn Sands. Badgers Holt A residential area to the west of Station Road, near the railway station. Named after wildlife that used to frequent the area when there was less happening on the site! Bishops Walk A dirt track turning into a footpath with steep steps from the side of St Michael’s Church, on Church Road in Aspley Heath, leading down to Hardwick Road, where it comes out opposite the old Library building. Recorded as ‘Zig Zag Lane’ in the 1881 Census. Blacksmiths Way A residential area to the west of Station Road, near the railway station. One of the early trades to operate from this site, which was also the home to several of the Woburn Sands brickworks. Blackthorn Grove Residential development northwards from the west end of Theydon Avenue. Bow Brickhill Road The main road out of Woburn Sands to the west, leading to Bow Brickhill. Of course, at their end, it is known as Woburn Sands Road! Burrows Close A residential development east off Weathercock Lane, one leg of it leads to a dirt track that connects to Mill Lane. The name comes from one Robert Burrowes, of Aspley Guise, who leased this area in 1662. Cable Crescent A residential area to the west of Station Road, near the railway station. Jack Cable was a WW2 navy signals engineer, who worked with James Summerlin in turning surplus government transmitters into high frequency industrial generators, and thereby starting the Plysu plastics business. He retired in 1982. Chantry Close A modern development of housing just north of the Station, east off Newport Road. Chapel Street A road west from the High Street to Hardwick Place, it has terraced houses on one side, with later houses the other. The Methodist Chapel (1879) stands on the corner where it meets the High Street. This road was only made up and tarmac’ed in the late 1950’s. Church Road The road from the Square into Aspley Heath. The church only arrived in 1868, before that the road was known as Aspley Heath. At the top it becomes a dirt track, which eventually meets up with Longslade Lane. Clay Gardens [Not shown on map above] Residential area which connects Fletton Dell to Greensand View. Clay was dug extensively here and turned into bricks. Club Lane A now pedestrianised lane, east off the High Street, leading to the area that was used by the Social Club and Bowls Club, recently converted to residential housing. Concra Park A cul-de-sac at the top end of Weathercock Lane. “Concra” was originally the name for a large residence at the top of Weathercock Lane, which changed its name to ‘Woodlands’ after 1863. The then owner had been the land agent for Lord Blayney at Concra in Ireland, and on returning to England, he used the name for his house and estate, on which this road was built. Cranbrook A modern residential development, once the site of a garage, on the west of Station Road. Cranfield Road The road leading from the railway crossing to Salford, and then towards Cranfield. When the railway came in 1846, this road followed a course directly behind the modern recreation ground and met Station Road nearer to the Weathercock Inn. In order not to have to build two level crossings, the road was turned to go alongside the railway and meet Newport Road. Deeth Close Housing west off Cranfield Road. Named after nearby Deeth Farm. Dene Close A cul-de-sac south off Aspley Hill. Named after the house called ‘The Dene’, which was built about 1890, by Harry Butler Mallam, a solicitor. When the house was owned by Harold Allan, director of Queens Works in Bedford, the grounds were regularly used for church fetes and staging local pageants. Downham Road A residential road built on land originally owned by Mr Down and Mr Needham. Down died in 1903, and his business partner laid out the road, but plots were only sold off at an auction in 1938, after Needham had also died. The name is an amalgamation of their surnames. It is east off the High Street, then turns south at the top and joins Aspley Hill. Drayhorse Crescent [Not shown on map above] A loop of road running mainly West – East, just south of the Railway Station. Horses would have been the main source of power in the brickworks that once covered this area. Eastaff Croft A residential area to the west of Station Road, near the railway station. John Eastaff was the sales manager for Plysu plastics in the 1940’s – 1950’s, which used to stand on this site. Elm Grove Housing off Blackthorn Grove, parallel to Theydon Avenue. Parker says that this area was laid out in plans as early as the 1880’s, but it was not opened as a road until well after the Second World War. The western side of this estate is where the Canadian Foresters brought wood down from the Duke of Bedford’s woods on a narrow gauge railway to be loaded onto the main railway to go off to the Front. Fir Grove Fir Grove once left southwards from Theydon Avenue, until it met the end of Wood Street, which continued to Chapel Street. Because the respective development owners could not agree, there was for some years a gate across the roads where they met. Later this was removed and Fir Grove gave up its name and became an extension to Wood Street. Firemans Run A residential area to the west of Station Road, near the railway station. On this site once stood the plastics factory of Plysu. Many of the staff were also firemen, and when the alarm bells sounded at Woburn Sands Fire Station, just across the road, they had to leave work in a hurry. The crew had an agreement that the first one there could drive the fire-engine! Fletton Dell [Not shown on map above] Connects Greensand View to Drayhorse Crescent. Fletton is the name of a type of brick, which was mass-produced locally. Georges Square Although sometimes given the prefix “St.” on postcards etc, it was never officially named so. This collection of cottages stood about half way up Sandy Lane, just where Holly Walk meets it. Demolished many years ago, all that remains is a patch of grass on the side of the Duke of Bedford’s Estate. George Lee was one of the last inhabitants. Also known as Leighton Hollow. Greensand View A residential area to the west of Station Road, near the railway station. The Greensand ridge is a geological formation that forms the ridge running through Woburn Sands. It ends nearby, where after the soil becomes far more clay-based. Hardwick Mews A modern development of houses south of Hardwick Road, on the site of a disused garage. Hardwick Place Now a cul-de-sac, this was originally the continuation of Hardwick Road, but the road was rerouted around the other side of Mowbray Green, and the old exit onto The Leys was then closed off. Hardwick Road Leading from the Square towards Bow Brickhill to the west. Heath Close Residential development east off Woburn Road. Heath Lane A dirt track at the top of Aspley Heath, once leading to the Daneswood Sanatorium for Consumptives and the Knoll School, but both these buildings are now flats. High Street The main commercial road of Woburn Sands, the tradesmen built their shop fronts out from existing houses and cottages on the east side of the road. There was little development on the west side, as this was owned by the local farm, and later the Vicarage, which gave land on the west side to became public halls. Part of the old Hockliffe to Newport Pagnell Toll Road. Once part of the A5130, it was declassified in 2017. Hillway Residential cul-de-sac east of Newport Road. Holly Walk A dirt track and footpath connecting Church Road and Sandy Lane, near the top of Aspley Heath. Hutton Way A residential road, to the east of Station Road and Weathercock Lane. Named after several generations of farmers around the Weathercock Inn and latterly the local building family. Kiln Drive [Not shown on map above] Runs West – East to the south of Drayhorse Way, connecting Drayhorse Crescent with Fletton Dell. Kilns were used locally in the production of bricks and tiles. Leighton Hollow This collection of cottages stood about half way up Sandy Lane, just where Holly Walk meets it. Demolished many years ago, all that remains is a patch of grass on the side of the Duke of Bedford’s Estate. Also known as Georges Square, but although sometimes given the prefix “St.” on postcards, it was never named so. Lime Grove Residential cul-de-sac south off Theydon Avenue. Lydbrook Lane A residential area to the west of Station Road, near the railway station. Lydbrook House, at 82 Station Road, was once nearby. That house was erected by Mr Handscomb as a garden nursery, but in later years was occupied privately, and during the 1914 War by the Revd. Snell, (who did most of his travelling on a ladies cycle, in front of which was a basket carrying a large ear-trumpet…) His wife came from Lydbrook, on the banks of the Wye, and in her honour, he named the house after her village. Maple Grove Residential cul-de-sac east off Blackthorn Grove. Mermaids Pond A much older name than you may imagine, there is a Bedford Estate book listing this pool by this name in 1791. Usually fairly dried up in summer, and a boggy marsh in winter. Mill Lane Now leads onto the Aspley Guise and Woburn Sands Golf Course, but until it blew down in 1900, this is where the local windmill was. The remains of the mill’s foundation timbers are still under one of the greens. Mowbray Green Now a local park, this was the site of Hardwick House, which was the home of two sisters, the Misses Mowbray. The site was cleared and converted to a park for the 1977 Jubilee. Narrow Path Dirt track connecting Church Road to Sandy Lane in Aspley Heath. Newport Road After the railway crossing, Station Road becomes Newport Road, and continues into Wavendon, and at one time the next large town along the road was Newport Pagnell. Once part of the Toll Road. Was once part of the A5130, but was declassified in 2017. Pine Grove Residential cul-de-sac south off Blackthorn Grove. Plysu Way [Not shown on map above] A short connecting way between two parts of Drayhorse Crescent. Plysu was a large plastics factory once based on this site. Regency Mews [Not shown on map above] Connects Fletton Dell to Greensand View. Not a Royal connection, but named after the regency brick, a type of Fletton brick produced locally. Ridgeway Residential cul-de-sac east off Cranfield Road. Russell Street The family name of the Duke of Bedford, who lives locally at Woburn Abbey. It connects the High Street to Weathercock Lane. This was the first of the main side streets to be laid out, it had been part of the Swan Farm estate, belonging to the Higgins family. It was known as Rilands fields, and sold to William Milligan, a property speculator and hat manufacturer from Dunstable, when auctioned in 1870. Sadlers Green Residential road east off Weathercock Close. Sandy Lane A very descriptive term for the dirt track leading from the bottom of Church Road to the top in Aspley Heath, just to its south side. Its condition has worsened due to increased wear in recent years, and it has now been blocked to traffic at the lower end, and at the end of Narrow Path. Originally, the main track over the Heath to the Brickhills. Shelton Court Cul-de-sac location of warden-assisted flats in the grounds of what was the Vicarage, west of the High Street. Named after Reverend John Shelton, vicar of Woburn Sands, 1913-1946. Silverbirches Lane Dirt track road at the top of Aspley Heath, west off Church Road. Leads to a house called “Silverbirches”. The house name was changed in about 1945 from “Silverbirch” by Frank Henley, a retired schoolmaster, who didn’t want the connection with corporal punishment. Spring Grove Residential cul-de-sac west off Station Road. This originally led to an area behind Station Road with a brook running through it, hence ‘Spring’. Sturdy Lane A residential area to the west of Station Road, near the railway station. Rohan Sturdy was an early director of Plysu, the plastics firm that once stood on this site. It moved here in 1947 from Egham. Sturdy had worked on audio systems with the RAF in WW2, and the high frequency machines he used were utilised after the war to weld PVC together, which Plysu developed into the first plastic macs. He stayed with the firm until the mid 1970’s. St Vincents Residential cul-de-sac west off Weathercock Lane. Station Road The Railway arrived in 1846; previously, the continuation of the High Street after Russell Street was referred to as Newport Road. Part of the old Toll Road. Was once part of the A5130, but was declassified in 2017. Summerlin Drive A residential area to the west of Station Road, near the railway station. James Summerlin was a Major at the War Office, and was an early director of Plysu, the plastics firm that once stood on this site. It moved here in 1947 from Egham. Summerlin went to America in WW2, working on early communications systems, and saw light industry factories which the war effort had produced. After the War, he founded the Plysu. Tansley Lane A residential area to the west of Station Road, near the railway station. A garage on this site, Lydbrook Garage, was once run by Aubrey Tansley. He also had a paraffin round in the local villages, and other Tansley family members ran a china shop and a grocers shop in the High Street. Tavistock Close Residential cul-de-sac west off Cranfield Road. Marquess of Tavistock is one of the titles in the Duke of Bedfords family. The Close A new development of houses, east off Station Road. The Grove Once a terrace of housing west off Station Road, which was absorbed into the Plysu plastics factory site after World War II, and has now been demolished. The Jitty An ancient footpath leading from the bottom of Aspley Hill, alongside The Duke of Bedford’s Estate, to Woodside in Aspley Guise. The Leys A long terrace of Victorian housing on the east side, thought to have been houses for the local brickworks, and the larger Leys Villas at the north end were for the foremen. Later buildings on the west, it connects Hardwick Road to Brickhill Road. The Square A name not used much anymore, this is the area of mini-roundabouts and traffic islands at the southern end of Woburn Sands, where Woburn Road, Aspley Hill, High Street, Hardwick Road and Church road all meet. The county boundary of Beds and Bucks passes through it, leading to a lot of confusion. As so many roads meet here, it is a favourite spot for a car accident, and I recall, 25 years ago, the emergency services telephone operator enquiring which side of the road an accident had occurred on, so they could send the correct county ambulance! Theydon Avenue Originally a tree-lined street west off Station Road, it has now lost its trees. Tidbury Close A modern residential cul-de-sac, south off Brickhill Road. Turnpike Court A modern development east off Newport Road, and connecting to Cranfield Road, named after the turnpike road. The turnpike or toll road lead from Watling Street at Hockliffe in the south, to Kingston Bridge, on the way to Newport Pagnell to the north. Vandyke Close Residential cul-de-sac east off Cranfield Road. Vicarage Street Leading east off the High Street, opposite the building which was the Vicarage until 1968. Weathercock Close Named after the nearby Inn. Weathercock Lane Now named after the nearby Inn, there are also references to this road as Aspley Road, but with so many similarly named roads in the district, the Post Office probably insisted on a more readily identifiable one. Leaves Station Road and meets with Aspley Hill. Werth Drive Cul-de-sac east off Church Road. West Road Residential lane west off Station Road. Wilkie Court A residential area to the west of Station Road, near the railway station. Wilkie Bliss once owned a coal merchants business on this site. A William Bliss first appears in local trade directories in 1898 as “William Bliss, coal & forage merchant, Railway station” before “Wilkie” appears in 1910. It remains as “Wilkie” until 1931, when it changes to William Henry Bliss, who continues until the end of that kind of trade directory at the outbreak of WW2. Woburn Road The road southwards to Woburn. Originally, the road went over a steep sandy ridge that was often impassable with deep mud in the winter, and could bog down coaches in loose sand in the dry summer. A cutting was made through the hill in the 1800’s, and the course of the road altered again in the 1980’s to allow mining of the Bentonite (Fuller’s Earth) that was under it. Part of the old Toll Road. It was once part of the A5130, but was declassified in 2017. Wood Street This residential street connects Chapel Street to Theydon Avenue. Wood Street leaves Chapel Street and runs northwards until it met the end of Fir Grove, which left southwards from Theydon Avenue. Because the respective development owners could not agree, there was, for some years, a gate across the road where they met. Later, this was removed and Fir Grove gave up its name and became an extension to Wood Street. Woodlands Way A dirt track leading up towards the Duke of Bedford’s woodland estate from Hardwick Road, and the location of Edgewick Farm, now a community resource. Zig Zag Lane A dirt track turning into a footpath with steep steps from the side of St Michael’s Church, on Church Road in Aspley Heath, leading down to Hardwick Road, where it comes out opposite the Library. Recorded as Zig Zag Lane in the 1881 Census, now known as Bishops Walk.